Angelina Bonaparte (pronounced Bon-ar-par-tay) is a female private detective working out of Milwaukee. Six years ago Marcy Wagner hired Angie to find out what happened to her school teacher husband, who just disappeared from her life and that of their three children, cleaning out the bank accounts and vanishing. In Honor Kills, by Nanci Rathbun, we find Angie stumbling across a clue that leads her back onto the trail of this long time cold case, which Angie’s professional sensibilities have never allowed her to let go. Hank Wagner was the one missing person case she had never solved, and she was determined to get to the bottom of this, even if it meant involvement with the Mafia and her father’s acknowledged, but never discussed, ties to the mob. Angie, her new intern Bobbie, and friends embark on a dangerous journey to hunt down the elusive Mr Wagner. 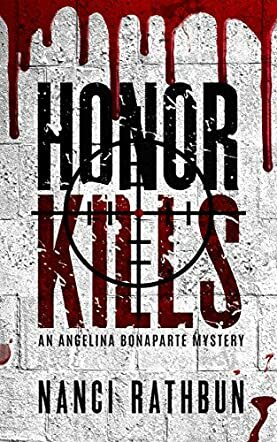 This story, Honor Kills, by Nanci Rathbun is a continuation of a series centered on the cases of Angie Bonaparte. Although I have not read the previous stories, it is clear each case is a stand-alone read and, I have to say, I found Honor Kills an extremely satisfying read. It ticks all the boxes of a good detective mystery, and the lead character Angie is extremely easy to empathize with. It’s not often you come across a middle-aged PI hero, who is also female. The plot was intricate and full of twists and turns as befits such a mystery story. I particularly enjoyed the supporting cast; her gay intern Bobbie and her tech genius Spider. The author had clearly done her research and the story line was both credible and enjoyable. The relationship between Angie and her father, the retired Mafia capo, was fascinating and confirmed the stereotype of two different Mafia bosses, one at home and one at work. Having read Honor Kills, I am motivated to read the other books in Rathbun’s series, which is probably as high a praise as a reviewer can give an author.